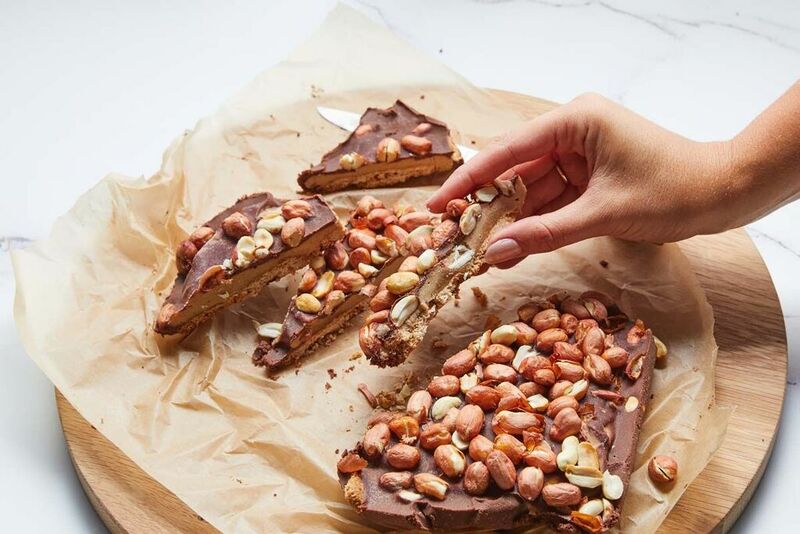 This is a healthy twist on one of our favourite choccy bars! We’ve subbed out the refined sugar and nasty bits and replaced with nutritious goodness. Store in the freezer until ready to serve as it helps keep the bar firm – perfect for treat days! Pre-heat oven to 180 degrees celsius and line baking tray. Soak dates in boiling water for 2-5 minutes. Combine all biscuit ingredients – the almond meal, flour, coconut oil, 1 tsp of the vanilla essence, and rice malt syrup – in a medium mixing bowl using a wooden spoon or mixer. Roll biscuit out onto baking paper and use a sharp knife to cut out small rectangular biscuit pieces (approximately 3cm x 2cm). Transfer to oven for 7-8 minutes or until golden brown. While biscuit layer is in the oven, combine all middle layer ingredients – the soaked dates, peanut butter, water, vanilla essence, and salt – in the food processor. Take cookies out of oven and leave to cool. Once cooled, line a medium shallow container with baking paper. Cover bottom layer of the container with the biscuits (try to make sure there are no gaps). Pour on middle layer and transfer to freezer for 30 minutes. Roast peanuts in the oven for 10 minutes and melt dark chocolate over a bowl of steaming water. Take bars out of freezer, sprinkle peanuts on top and drizzle with dark choc. Cut into slices and store in the freezer until ready to serve.